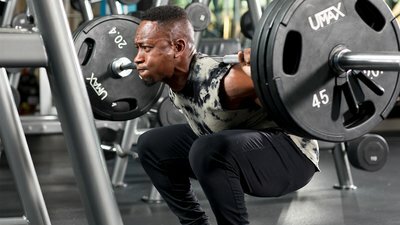 How many reps can you lift with your 4RM weight? The answer may seem obvious, but you have more potential in this crucial strength-building range than you think. This is the smart way to get strong! There are many ways to get strong. But there are also some irrefutable hard truths of strength training that all of us inevitably come up against. One truth is that if you want to get stronger, you'll need to use heavy weights—period. Put slightly more complexly: In order to improve a muscle's strength, it must regularly have to generate near-maximal resistance. But another truth that goes along with that first one is if all you do is heavy doubles and triples without much variation, you'll predictably hit a strength plateau sooner or later, and fry your nervous system—and your motivation to train—in the process. Now, I'm not about to say you need to overhaul your strength training and start relying on fancy-shmancy training methods with unique equipment, exotic accessory moves, and rep schemes pulled from some soon-to-be-published study that you probably don't entirely understand. Small tweaks can make all the difference! One of my favorites is what's known as cluster sets, a uniquely challenging way to get more reps out of your rep-max weights. Before we dive into how to do cluster sets, let's talk about how they work. A set of 3-5 reps may take somewhere around 15 seconds to complete, but no more than that. That makes the lift primarily reliant on your body's ATP-PC energy system, which uses creatine and phosphorus to create instant cellular energy (or ATP) without the presence of oxygen. It's the same system you'd use when sprinting a 100-meter dash or doing one massive keg toss. The problem is, this energy system doesn't last much longer than 10-15 seconds. Once it's depleted, slow-twitch muscle fibers begin to take over the exercise, your strong, explosive fast-twitch fibers drop out, and your glycolytic energy system becomes the major driver. As the set stretches on, you'll also feel your strength getting limited by the production of lactate, which is what explains the "burn" you feel from extended muscular endurance work—think of a tough set of 20 biceps curls or leg extensions. The ATP-PC system is where you want to primarily hang out for pure strength work. Fortunately, "hacking" this system is remarkably easy, since it only needs a few seconds to begin rapidly refueling itself. Even just a brief pause between heavy reps can be enough to give you an extra rep's worth of energy. That's the idea behind cluster sets. To perform a cluster set, you'll take a heavy lift that you would normally do in a single set, and break that set up into 2-3 mini-sets or segments, each separated by 10-15 seconds of rest. This rest time is crucial—it's enough to give your ATP-PC system the chance to partially, but not fully, restore itself. Here's my favorite way to do them with any variation of the squat, deadlift, strict press, or bench press. With a 4RM weight: Get tight and lift the weight for a set of only 3 reps, and rack the weight. Now, rest for just 10-15 seconds. Then, get tight, and get back in for 2 more reps. Rack it again. If you're feeling really strong, rest for the same 10-15 seconds, and then go for another single. If not, stop after the double. You've just performed 5-6 repetitions with your 4-rep max. Thanks to the mini-break you've taken midway through your set, your ATP got to rejuvenate itself just enough for you to get an extra effort out of your muscles. That's what I call using your head. From a cumulative perspective, the real benefit of this approach becomes clear. Adding 2 reps to each set can turn into 20 or more heavy reps over the course of a workout or two. In the strength training world, that's a significant increase that can put a real dent in a lingering plateau. With a 3RM weight: Perform 2 reps. Rest for 15 seconds, then perform another single. Rest again for 15 seconds, then go for that extra rep. That's 2/1/1 all told. With 95% of 1RM: Perform 1 rep. Rest for 30 seconds, and continue performing singles with 30-second breaks between, until you've hit 10 reps. This last option is much more challenging than it looks on paper, and you'll be gasping for air by the end. So, it comes with a disclaimer: If your body isn't feeling in top shape, or you're nursing any injuries, save these for another time. Cluster training can be used in the form of "ladder sets" to create huge conditioning benefits, and to give your body a solid muscle-growth response in the process. Sure, you'll be working beyond the 10-second phosphate energy system phase, but the basic principle is the same: Rather than hitting your limit in a single set, you'll break it up and do more quality work. Ladder sets increase the number of repetitions as the set continues. This makes up for the submaximal load, and also brings your psychology into play a little more—because, trust me, you'll be tested here. Use a 12-rep max: Perform a set of 2, 3, 5, and finally 10 reps. That's 20 reps with a 12-RM weight! Make no mistake, this is an arduous task. But, as far as big lifts go, it's very doable, especially if the lifter doesn't have insanely strong strength PR's and isn't extremely heavy in weight. In other words, a 200-pound guy with a squat max of 335 or so would probably see great results with this training method. A 300-pound guy with a squat max of 520 might not, for several reasons. Here's a video to get the idea. That's 225 pounds, but by the end of the 10-rep set, it felt like far, far more. In these sets, be sure to stay honest and maintain solid technique and, of course, full range of motion. It's a given that your heart rate will be going through the roof, so feel free to rest-pause for a couple of seconds to gather yourself between repetitions (as you see I do in the video). Go try any of these, and expect to feel the same old weight challenging you in a whole new way.